Is Australia the Key to US Containment of China? Domestic factors may lead Australia to take a more active role in challenging Chinese assertiveness. While the attention of the United States continues to be focused on the Middle East and the battle against ISIS — despite President Obama’s hope to “pivot to Asia” — China has been behaving in an increasingly aggressive way in the Eastern Pacific, claiming large swaths of ocean as its territorial waters. It has built artificial islands on reefs in the ocean that are under dispute with other Southeast Asia countries, such as the Philippines and Vietnam. China has also deployed fighter jets and anti-aircraft missiles on another disputed island in the South China Sea. China’s actions have threatened freedom of navigation through the South Pacific, potentially jeopardizing the $5 trillion of seaborne trade which traverses the region annually. In response to the Chinese actions, which have been denounced not only by the United States, but also throughout Asia, the U.S. has endeavored to organize greater military cooperation among the nations of Asia, including Japan, Vietnam, the Philippines, and Australia. In addition, India, a long-time foe of China, has recently stepped up its cooperation with the emerging anti-China alignment and even Indonesia, which has recently clashed with China over the activities of Chinese fishing boats in territorial waters claimed by Indonesia, may be attracted to the grouping. Yet, in many ways, the key to containing China may lie in Australia, a country of 24 million people with decidedly mixed feelings about China. On the one hand, as an island nation, Australia is heavily dependent on maintaining freedom of navigation in the South China Sea, through which much of its trade passes. On the other hand, China is Australia’s main trading partner, and a major consumer of Australian raw materials such as iron ore. These conflicting pressures have generated a rather schizophrenic Australian policy toward China. Thus, while Australia has an agreement with the United States to rotate 2,500 U.S. troops through its northern port of Darwin, it has also signed an agreement to lease the port to Landbridge, a Chinese company linked to the Chinese military. In addition, the recently released Australian Defense White Paper called for the acquisition of 12 advanced submarines along with other naval craft, which could be used against China. The white paper clearly states that Australia opposes any coercive or unilateral actions to change the status quo in the South China Sea. Reinforcing this articulated position, in a recent visit to Japan Australian Foreign Minister Julie Bishop reiterated Australia’s “unshakable” commitment to freedom of navigation through the South China Sea. 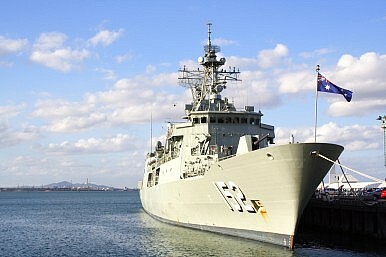 Nonetheless, Australia has yet to send one of its navy ships through the disputed waterways, despite the urging of U.S. Admiral Joseph Aucoin, who visited Australia at the end of February. So far, Australian Prime Minister Malcolm Turnbull, who replaced Tony Abbott in an Australian Liberal Party palace coup in September 2015, has remained reticent about Australia’s willingness to directly challenge China by sending Australian naval vessels through the Chinese-claimed waters. During Turnbull’s forthcoming visit to China, the Chinese leadership may be expected to pressure him not to do so. But this could change, for two reasons. First, Turnbull is likely to call for an early election, most probably in July, and this would open him up to increased criticism of his defense policy from the opposition Australian Labor Party, which has been rising in the polls. Labor’s defense spokesman, Stephen Conroy, has already blasted Turnbull for his lack of action and “vague” language” on freedom of navigation in the South China Sea. In addition, Tony Abbott, a strong proponent of more muscular action against China and of closer Australian-Japanese defense cooperation, may snipe at Turnbull during the campaign for the lack of toughness in his defense policy. Second, by mid-year, a decision will be made on whether Australia will buy its submarines from Japan, France, or Germany. Japan reportedly has already promised Turnbull that some of the components for the submarines would be built in Australia — a needed shot in the arm for Australia’s defense industry, especially in cities like Adelaide where jobs have been lost because of a declining automotive industry. If the decision favors Japan, this would strengthen Australian-Japanese ties at a time of rising Sino-Japanese tension. While such a decision would not guarantee that Australia would send its naval vessels through the disputed waters of the South China Sea, it would make Australia, de facto, a more prominent member of the growing anti-China alignment in Asia. This is the reason that the Chinese have condemned the proposed submarine sale so strongly. In any case, the coming Australian election and the submarine procurement decision may provide important clues as to the future direction of Australian policy toward China. Dr. Robert O. Freedman, Peggy Meyerhoff Pearlstone Professor of Political Science Emeritus at Baltimore Hebrew University, is Visiting Professor of Political Science at Johns Hopkins University. He recently returned from a research trip to Australia. The debate often misses the regional context surrounding Australia’s submarine program.